I’m just now climbing out from under the New Years/Christmas/Travel/Work Craziness. My lovely wife bought me a “Ah-So” wine opener for Christmas. She apparently had to battle people on EBAY for it because she wanted to get a cool retro one that was made in West Germany. Cool points. Bless her. The ah-so is a clever littler wine opener that I wanted primarily because it makes opening up bottles with really old corks easier (sometimes those corks are so old and soft that the screw-part of the corkscrew will just go right through them). The ah-so works by going on the outside of the cork instead of going through the cork. You just slide it in (ah yea) and the pull it out. 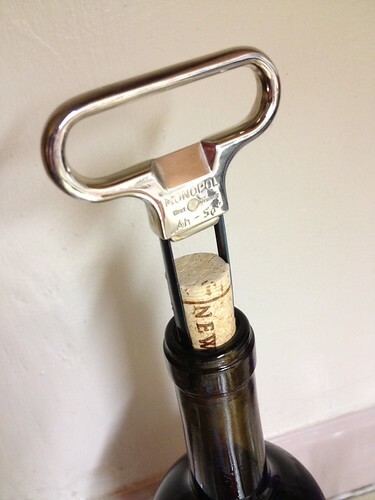 Oh, and another feature is that you can pull a cork and then replace fairly undedected. Sneaky.